It kept much more possession, at times appearing to purposely keep the ball for a beat or two before passing. It mustered more shots in the first half (five) than it did in the entire game against LAFC (four). That translated to a different result for RSL, which played to a 1-1 draw with Sporting Kansas City on Sunday night in the first leg of the Western Conference semifinals at Rio Tinto Stadium. The second leg will be in Kansas City on this coming Sunday at 1 p.m. Mountain Time. Due to the aggregate scoring model in Major League Soccer, RSL will advance to the Western Conference championship with a win or a draw in which it scores two or more goals. The first half moved slower than molasses on a cold day. Real kept the ball almost 70 percent of the time and the teams only managed 11 shots combined in 45 scoreless minutes. Petke said he thought his players had heavy legs in the first half. Real had 10 shots, three of which were on target. Most of those came from Rusnák, who tallied four shots for RSL. But he won’t be on the field next week in Kansas City due to picking up a yellow card on his first foul in the 26th minute. Damir Kreilach said it will be difficult to have Rusnák on the sidelines because he is one of the most important players on the team. But he is employing the next-man-up mentality. Rusnák, in the 52nd minute from inside the 18-yard box, chipped the ball to Kreilach, who headed the ball back to Rusnák for the right-footed strike and a 1-0 lead. • Albert Rusnák will miss the second leg in Kansas City due to a yellow card accumulation. • Nick Rimando tallied four saves and two punches. Petke said the team came out with more “gusto” in the second half after seeing slow off-ball movement in the first. SKC equalized in the 60th minute with Diego Rubio’s goal off Felipe Gutiérrez’s assist. Another disappointment: Because of a yellow card accumulation, Rusnák will be forced to sit out the second leg at Kansas City, meaning Real must go forward without one of its primary offensive weapons. Damir Kreilach said it will be difficult to have Rusnák on the sidelines, but he is employing the next-man-up mentality. 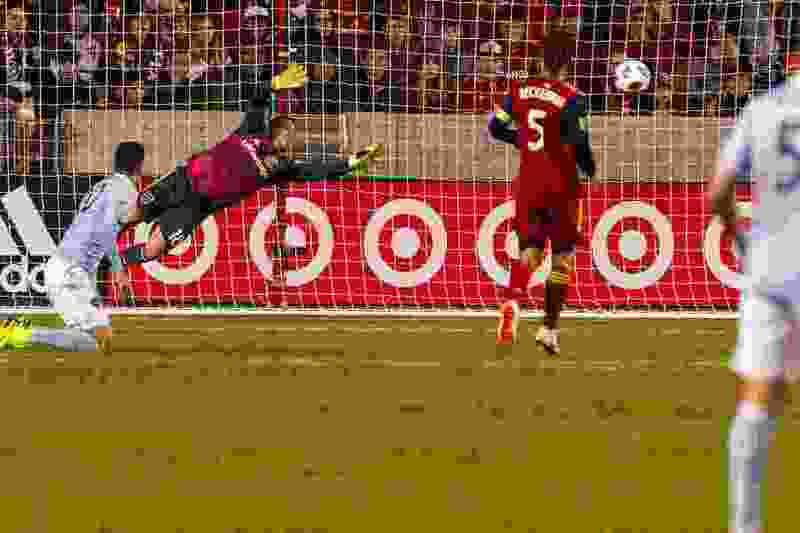 RSL’s defense saved a sure goal in the 74th minute. Sporting KC earned a free kick after Kyle Beckerman was given a yellow card. Rimando punched the ball out of the box, but it went right to another KC player, who shot hard at goal. Rimando saved that attempt with his glove. The ball rebounded to KC for another shot that Nedum Onuohoa kicked away. Marcelo Silva appeared to get injured in the first half and was replaced by Justen Glad in the 41st minute.